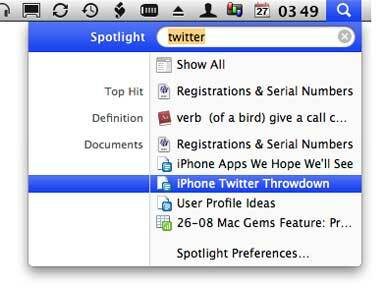 Mac OS X’s Spotlight search technology makes it easy to search the contents of documents on your Mac’s hard drive. But what if you’ve embraced our cloud-storage future and keep some—or all—of your documents online using Google Docs? Precipitate , a project hosted on Google Code, is a System Preference pane that lets Spotlight search your Google Docs, Google Bookmarks, and Picasa online photo albums. Specifically, Precipitate connects to Google’s servers and then creates, on your Mac, Spotlight-compatible index files that are searched by Spotlight. It then updates those indexes periodically. To set up Precipitate, you install and open the preference pane, enter your Google account username and password, choose which content—docs, bookmarks, and albums—you want to be able to search using Spotlight, and then click on Refresh Now. The initial indexing will take at least a few minutes, and could take significantly longer, depending on how much content the software needs to index. After that, you just use Spotlight as you normally would; search results residing on Google’s servers display the appropriate icon—Google word processor, Google spreadsheet, and so on. Because Precipitate has to regularly check Google’s servers for changes to your online content, it can take a while for any changes you make to documents, bookmarks, or albums to be reflected in the indexes on your Mac. The Precipitate documentation claims that updates to online data won’t be reflected in Spotlight searches for “up to an hour,” but it can actually take longer than that. (You can always force a refresh via the preference pane.) Another limitation of Precipitate is that if you’ve got multiple Google Docs accounts, Precipitate only lets you sign into—and, thus, search—one account at a time. Updated 6/11/09 3:30pm: Clarified that Precipitate is hosted on Google Code, not a product of Google Code.